Furnished and fully self-contained with high end finishing throughout, a comprehensive home entertainment system, complimentary Wi-Fi, modern kitchen and more, this luxury apartment is well-equipped for comfort and enjoyment, ideal to suit the needs of the discerning traveller or executive looking for a long stay in Perth. With contemporary furnishing our apartment is fully furnished with separate living, dining, bedroom and offering huge balcony areas. Large opening sliding doors allows you to enjoy an abundant amount of daylight and fresh air and ensuring a luxurious home away from home. Our feature spacious balconies allow you to enjoy the stunning views of Perth’s Swan River and city skyline from every room. Our apartments also feature modern well-equipped full kitchen with oven, family-size fridge, microwave, toaster, coffee machine and kettle, as well as luxury linen and a washer/dryer for extra convenience. Embrace the stunning views that await you plus over 9 bars and restaurants just a few minutes’ walk from your apartment. All rates are stated in Australian currency AUD with no hidden extras! Our spacious two bedroom apartment makes a great base for exploring everything Perth has to offer – whether for your next getaway with the family or with friends. Your ultimate dining destination is less than 5 minute walking to Crown Towers to experience the impeccable list of local restaurants and bars plus the world-renowned restaurants including Rockpool Bar & Grill, Silks, Bistro Guillaume and Nobu. Enjoy an array of local and international cuisine without having to drive! Alternatively a few minute’s drive to the Perth CBD and enjoy a dazzling host of restaurants, shopping, entertainment and nightlife. Exclusive Private Estate just a few minute’s walk from Crown Towers, easy walking to Swan River, bus, train and Optus Stadium. Complimentary mountain bike available to cycle the trails and parks to Perth’s City centre. WHY CHOOSE A PRIVATE APARTMENT OVER A HOTEL? Considerably larger living (160 sqm)! Full kitchen - save AUD on eating out! * This property is not suitable for babies or toddlers due to high balcony and glass furniture items. I have stayed in 5 star accommodation before but my experience at this apartment has set a new benchmark. Its proximity to the city centre allowed easy access to all my business meetings. The parks and public spaces nearby were ideal for running, even at night. My apartment was well appointed, comfortable and stylish. For me, what really set this experience apart was the stunning views of Perth from the balcony. My compliments to the booking agent who was efficient, genuinely friendly, helpful and thoughtful. Absolutely loved it. We found it very convenient for business and pleasure with all the creature comforts of home plus more, the service we received was First Class with nothing being too much trouble. We felt very safe with the security system at the apartment and would stay there again when the need arises. This apartment would have to be one of the best apartments I have ever stayed in. Not just in Perth but throughout the world. It is luxuriously appointed with one of the best views available in Perth. The apartment balcony overlooks the Swan River and Perth City skyline. I would recommend to every person intending to visit Perth to stay in this apartment. It is worth it! A magnificently detailed apartment which far exceeded our expectations. Secure, clean and close to city. Bus, train and airport all conveniently close by. Had everything we needed and more! For those wanting a quiet, relaxing, executive stay I cannot recommend more highly. A premium apartment in a private estate in a class above the rest enjoying beautiful river and city views with quality furnishings and appliances throughout. Simply put .. your home-away-from-home. 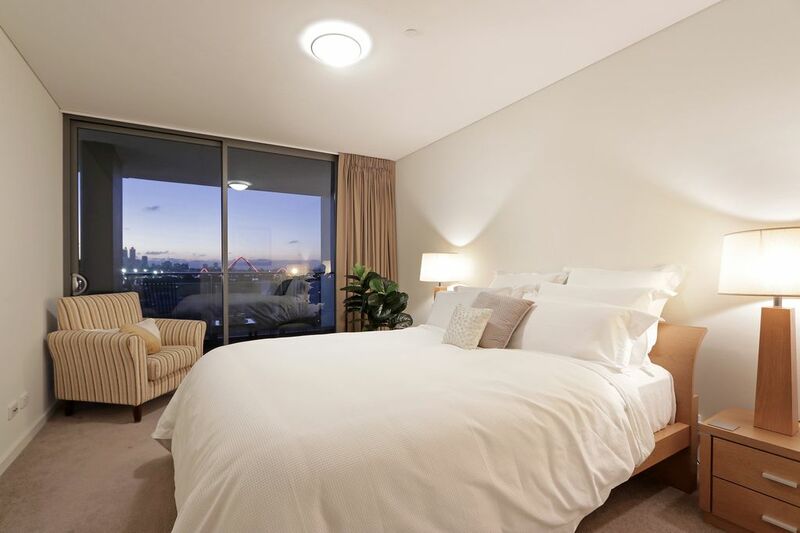 City Views - 5 min transport to Perth CBD or walk or cycle to Perth CBD! Large Flat Screen TV Includes FOXTEL SPORTS & Chromecast for Neftlx, Stan, You Tube etc from your own device. includes FOXTEL SPORT & CNN plus Chromecast for Netflix & YouTube etc to cast from your mobile or laptop. The apartment was very comfortable and had everything I needed for a 3-week stay. It was very quiet and the view from the balcony was superb. A magnificently detailed apartment which far exceeded our expectations. Secure, clean and close to city. Bus, train and airport all conveniently close by. Had everything we needed and more! For those wanting a quiet, relaxing, &quot;executive&quot; stay I cannot recommend more highly. Stunning river & city views from every room..